Watching Alex Ross Perry's Golden Exits without any prior knowledge of its origins, one might be forgiven if they initially mistook it for a Woody Allen film from the late 1980s. Perry's unassuming style and fussy, subtly neurotic characters recall the period of Allen's career that gave birth to such films as Another Woman and September; both often regarded by critics as minor Allen films, yet carrying some of the finest work he ever produced. Allen, of course, was hugely influenced by the films of Ingmar Bergman and John Cassavetes, as well as the plays of Anton Chekhov, during this period. 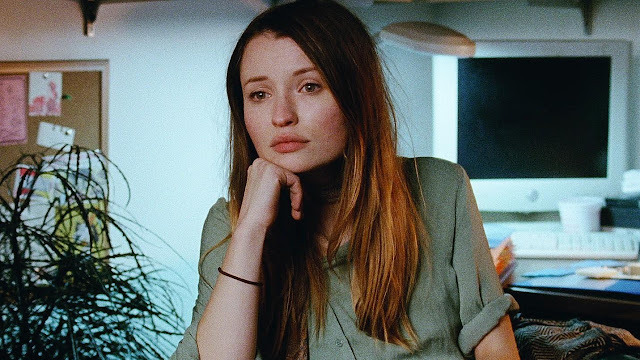 In Golden Exits, Perry seems to be channeling them all into something that feels at like both an homage steeped in its inspirations, and a thoroughly modern American indie. It is telling that the central character is an archivist. Nick (Adam Horovitz) is a middle aged man who makes a living archiving the personal affects of the recently deceased. He likes order, routine, and thanks to his job, lives almost exclusively in the past. He hires a young, British intern named Naomi (Emily Browning) to help him complete his latest task, much to the chagrin of his wife, Alyssa (Chloë Sevigny). Nick, we discover, had been unfaithful in their marriage years before, and the two have just begun to recapture a sense of trust and normalcy. Alyssa's more cynical sister, Gwendolyn (Mary-Louise Parker) is especially suspicious of Nick's motives. But Nick isn't the only one with eyes for Naomi. Buddy (Jason Schwartzman), the husband of Gwendolyn's longtime friend, Sam (Lily Rabe), is asked by his mother to help show Naomi around town. Unbeknownst to them all, Naomi's presence has massive ripple effects throughout their tiny little world. Call it “Seven Characters in Search of an Exit.” These are all people who feel trapped by their circumstances, naturally drifting apart but unable to disentangle themselves from the familiar routines of their daily lives. Perry frames the characters as if they are actually moving further apart in the literal space of the frame, yet are ultimately contained by its rectangular confines. They are all looking for that "golden exit," an excuse to leave, to start again, to move on; but as one character points out, it's easy to move on from friends, yet family is forever. Perry eschews the handheld aesthetic of his previous films like The Color Wheel and Listen Up Philip, opting instead for long, steady medium shots and haunting close ups, recalling the chamber drama character pieces of Allen’s mid-period. He juxtaposes leering close-ups from the lecherous men with distancing long shots of the object of their desire, making the audience recoil from their advances. And yet, Perry never really condemns of exalts his characters' actions. They are bored, unhappy, and often willing to look within to find the source of their own misery. Golden Exits doesn't offer a pat "there's no place like home" solution for their troubles. Instead, it's a modest, introspective, and quietly poetic exploration of familial ennui, where a settled routine doesn't necessarily equate to happiness, and the upsetting of the routine reveals cracks in the facade. It displays a remarkable growth for Perry, who remains one of the most exciting voices in American independent cinema, moving past the occasionally precious millennial neuroticism that is so often the hallmark of American indies, and into a much deeper, formally bracing, more emotionally satisfying territory. 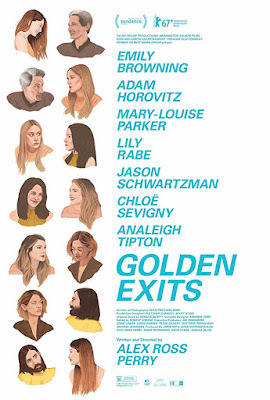 GOLDEN EXITS | Directed by Alex Ross Perry | Stars Emily Browning, Mary-Louise Parker, Adam Horovitz, Lily Rabe, Jason Schwartzman, Chloë Sevigny, Analeigh Tipton | Rated R for some language and sexual references | Opens Friday, Feb. 9, in NYC. Expands to additional cities on Feb. 16.